A quick pasta dish that’s light on ingredients but big on flavour. With high-fibre nuts and fresh greens, it’s low in saturated fat and gives you 1 of your 5 a day. 1. Cook the pasta in a large pan of boiling water for 9 minutes until al dente. 2. Meanwhile, cook the asparagus in a pan of boiling water for 2-3 minutes until al dente then cool under running water. Drain and pat dry on kitchen paper then toss with half the oil. 3. Heat a large ridged griddle or heavy non-stick frying pan and cook the asparagus on a high heat for 2-3 minutes, in batches if necessary, turning once or twice until charred. Cut in half widthways. 4. Drain the pasta and return to the pan. Heat the remaining oil in a small saucepan and add the garlic and chilli. Cook for 1 minute until just golden then add the walnuts, orange zest and juice and bring to the boil. 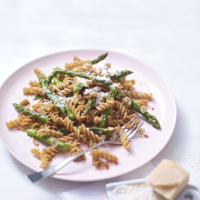 Add to the drained pasta with the asparagus, toss together and serve sprinkled with the grated cheese.